Which framework should you use? An answer from 3,000 developers. Who hasn’t heard about the battle between Facebook’s PyTorch and Google’s Tensorflow? A quick search will reveal the intensity of this clash of frameworks. Here is one great article by Kirill Dubovikov. And here is your chance to defend the framework you believe in the most. Taking all of this into account we can say that almost anything created in one of the frameworks can be replicated in the other at a similar cost. Therefore, the question stands. Which framework should you use? What is the main difference between each community? At /data we are constantly surveying the developer community to track the trends and predict the future of different technology sectors. For machine learning in particular this clash is critical. The prevailing framework, if there is one, will have a huge impact on the path that the machine learning community will take in the years to come. With this in mind, we asked the developers who said that they are involved in data science (DS) or machine learning (ML) which of the two frameworks they are using, how they are using them and what else they do in their professional life. Tensorflow is winning the game, but is PyTorch playing on the same console? 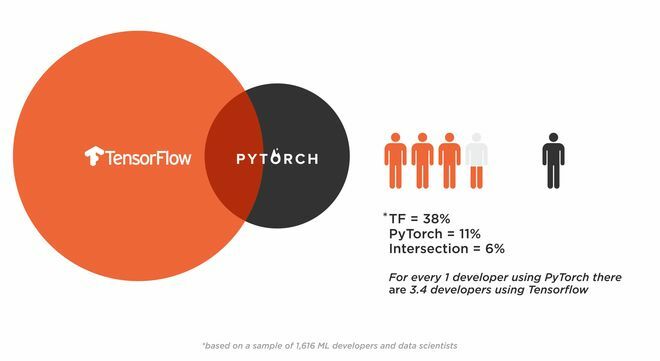 From the 3,000 developers involved in ML or DS we saw that 43% of them use PyTorch or Tensorflow. This 43% is not equally distributed between the two frameworks. Tensorflow is 3.4 times bigger than PyTorch. 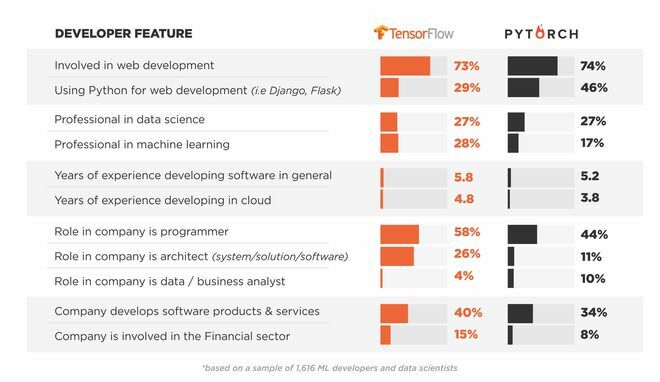 A total of 86% of ML developers and data scientists, said they are currently using Tensorflow, while only 11%, were using PyTorch. Moreover, PyTorch has more than 50% of its community also using Tensorflow. On the other hand, only 15% of the Tensorflow community also uses PyTorch. It would seem like Tensorflow is a must but PyTorch is a nice-to-have. Who is using PyTorch and who is using Tensorflow? What is each framework being used for the most? It is conclusive. In comparison to PyTorch, Tensorflow is being used in Production and most probably deployed to the cloud, as implied by the significantly higher backend experience of Tensorflow users (4.8 years vs. 3.8 of PyTorch users). As compared to PyTorch, Its community is composed more of professional machine learning developers (28%), software architects (26%) and programmers within a company (58%). This is most likely due to Google’s focus on deployment through APIs such as Tensorflow serving which has become a key motivator for the adoption of Tensorflow for many developers who are trying to push data products into production environments. On the other hand, PyTorch is being used more than Tensorflow for data analysis and ad-hoc models within a business context (10%). In the PyTorch community there are far more Python-first developers (i.e developers using Python as a primary language) who work on web applications (46%). Moreover, the versatility of this Pythonic framework allows researchers to test out ideas with almost zero friction and therefore it’s the go-to framework for the most advanced cutting edge solutions. Do you use any of these frameworks? Have your say in our bi-annual survey currently running and let us know how you are building those convolutions – and win some awesome prizes in the process. Eitan is part of the analyst team in SlashData and in charge of everything data related. Starting off with setting proper statistical tests and corrections to keep our data always clean and correct. His slogan is "0 Bias". When the data is ready its time for the deep dives with simple and complex machine learning tools that are used to find hidden insights for the rest of the team to elaborate on. His slogan is "Give me the haystack and I will give you the needle".